Combine the olive oil, vinegar, chilli, garlic, pepper and coriander in a small bowl. Whisk until well combined. Taste and season with salt and pepper. Set aside. Bring 3 litres of water to the boil in a large saucepan over high heat. Add the Fragrant Jasmine Green Tea and stir to combine. Place the prawns in a bamboo steamer over boiling water and cook for 3-5 minutes or until prawns change colour and curl. Combine the puffed quinoa and sumac in a small bowl. Drizzle half the dressing over the salad leaves and gently toss to combine. 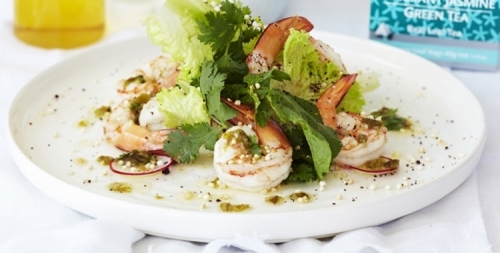 Arrange salad on serving plates with radishes and prawns. Drizzle with remaining dressing and sprinkle with quinoa.